At Lica Home Services, presents five basic tips or can say the type of chemicals which you can use on a daily basis to Pests & Fleas. There are few things to do in order to keep your house clean, fresh and pest free. Order our services now and get best Pest control In Brisbane. Sticky flea pads are similar to the flypaper that many households used decades ago. Generally, it’s attached to an electronic trap that you plug-in near the location that is severely infested with fleas. Fleas are attracted to the trap over a period of weeks and get stuck on the paper. The drawback to using sticky traps is that they appear extremely unsanitary and take a long time to eradicate fleas. It’s important to use traps for a significant period of time to ensure all fleas are captured and that you bathe all animals in the home (as specified above) to reduce the number of parasites living off your pet. Boric-acid-based products are a highly recommended solution for flea infestations, particularly when there are animals living in the household. Boric acid is not toxic to people or animals, but it kills fleas. When boric-acid-based products are sprinkled on the carpet and throughout the infected household, the extremely fine particles of boric acid work their way into the carpet and are not easily sucked up by vacuum cleaners. The trick is to sprinkle a layer on the carpet and use a broom to work it down into the fibres, and then vacuum off any excess. As fleas come in contact with the particles they quickly die. However, this means that it is extremely important to vacuum the floors regularly to reduce the dead fleas that are in your carpet. When it comes to homes with tile, wood or linoleum flooring, many health-conscious individuals choose to use Nylar, aka pyriproxyfen, to eradicate a flea infestation. Nylar regulates the growth of fleas and is commonly used where pets spend most of their time. Nylar only needs to be applied once a year to clean up flea infestation. Nylar is unique in the way it works — it mimics the juvenile flea hormone, preventing young fleas from becoming adults. It also stops flea eggs from hatching, reducing flea populations drastically. Homemade rosemary flea dip is a DIY recommended a holistic cure for canine flea infestations. You place two cups of fresh rosemary sprigs in boiling water for half an hour, strain the liquid and add it to a gallon of warm water (it must be warm to be effective). You could also add 2-4 drops of rosemary essential oil to your warm water. When the solution is warm, but not too hot, pour it on a flea-infested dog and let the dog air dry. Be sure to not let the dog lick or scratch until it is dry. Lavender the essential oil can serve as a natural flea killer when it’s applied to dogs. For a 50+ pound dog, you just place one drop of oil at the back of the neck and one at the base of the tail to control flea infestations. For a smaller dog, just start with one drop at the back of the neck to start. A few drops of lavender oil can also be applied to baseboards in areas where flea infestations are troublesome. Though you can do not have to go through such a lengthy process because it takes loads of your leisure time which you can dedicate to your loved ones. You can just simply order our services and we will take of each and everything. At Lica Home Services, we give the best pest control services in Brisbane in order to get service at a 20% discount orders our services now. Carpet cleaning is not as easy as it seems. As such, there are many issues linked to carpet cleaning most of which are bound to compromise the outcome of the cleaning process. Carpet cleaning is not just about cleaning the debris and stains on your carpet. A lot needs to be done for your carpet to be cleaned properly. Most homeowners are not conversant with these issues, which explain why they do not match the standards set by professional carpet cleaners. 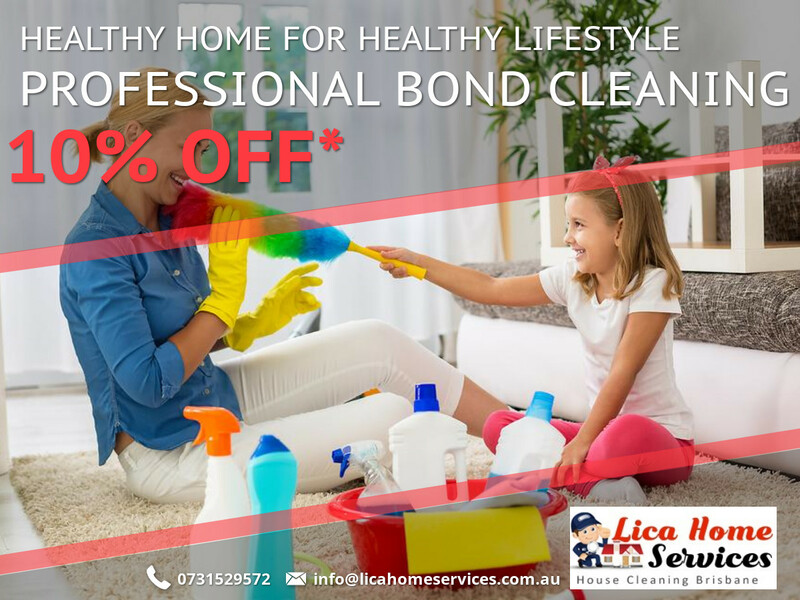 Though you shouldn’t think of doing the same when you got Lica Home Services, the best bond Cleaners in Brisbane. Most people often make the mistake of over-wetting when it comes to carpet cleaning. This poses a challenging considering that you do not have to apply more water than what the machine can recover. Once you are done the cleaning, excess detergent often attracts more grit and soil. In a way, making this mistake often downplays the benefits of cleaning your carpet. Accumulation of dirt on your carpet is an eyesore that is bound to compromise the overall look of your carpet. Whenever you feel your carpet is wet or whatever just give a call at Best bond Cleaners in Brisbane and we will be there in any minute or so. Rippling is another challenge when it comes to carpet cleaning. When cleaning your carpet, you should be careful to avoid overstretching it. Ripping your carpet is costly considering that you might be forced to replace it with a new one. In this regard, instead of cleaning your carpet, it is advisable to go for Lica Home Services These are the Professionals who know how to clean well and at the same time how to mitigate the chances of ripping. We are the best bond Cleaners in Brisbane who make sure you don’t have to face such issues so it’s advisable that please choose your Professional team very carefully like us at Lica Home Services. Poor cleaning methods do not cause furniture stains. They are usually caused by direct use especially when the carpet is in constant contact with some furniture. Dealing with furniture stains is not easy and requires some expertise. Once you have it clean, it is advisable to have some plastic tabs to mitigate the likelihood of having furniture stains. Whenever you feel that there is a Stain or whatever make sure that you call us to give yourself a hospitable environment. We at Lica Home Services doing the same work since years now. Most homeowners have experienced a brown spot appearing after cleaning their carpet. Carpet wicking normally causes these brown spots. Wicking often results when the carpet is stained deep down to the root of the fiber. When the fiber is moistened, the stain becomes noticeable on the surface. Sales Professionals know what it takes to address spot wicking and browning. Spot treatment mostly does this and drying the carpet quickly. We at Lica Home Services are quite proficient in the same field for many years. Regular carpet cleaning is more important than most people think. However, you also need to ensure the job is done right by enlisting the services a professional carpet cleaner. This will improve not only the appearance of your carpet but also its lifespan. Note:- Call us whenever you feel you want to get your carpet or house cleaned we will be there. Get up-to 15% discount if you order our services by this week. Since decades it’s been inception that smells of chemical is the main aspect of cleaning which can make you believe that your surroundings are clean and organic which is totally a false statement. People used to think that until the chemicals are not going to be used the places going to be dirty only but this is no longer the quality measurement because now environmentally friendly and harmless is the solution. So is there any way of avoiding harmful chemicals and to go for organic stuff which is more useful, cheap and harmless. Oh, a Big YES! Moreover, you can make your own goods which can be helpful in the regular cleaning of homes, The following is the list of items and it's used. Good Luck! Distilled white vinegar- cuts grease and soap scum, dissolves mineral deposits, inhibits mold, freshens; Which kills almost 99% of bacteria, 82% mold and 80% of viruses. Believe it or not but your kitchen sink has more germs than your toilet seat. Yes, there are other places too where chemicals are used to disinfect the place but sinks and washing areas are one of those sensitive places where the use of chemicals is huge so to prevent that there is also a home remedy which people can use to get rid of dirt and germs. Tip: Apply the white vinegar in your home where you find maximum germs and let it sit for a couple of minutes. Once it dries up you can wash it nicely and you’ll see the overall shine and germ-free place without any harmful chemicals. Do you know that human sheds 10 grams of dead skin a week? Yes, it's a fact. This also means that one must and always clean their bed linen from time to time to avoid any allergies, you can use neat and clean bed sheets, wash your pillow covers and vacuum your mattress regularly. Note: These above tips aren’t very easy or durable so it is highly recommendable to order a bond cleaning service regularly in order to keep your place standardized and alluring. 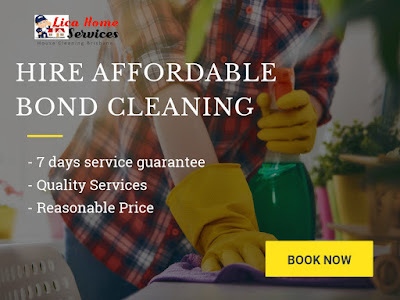 To avail latest offers please order our service now, Lica Home Services takes a huge pride to announce that we are efficient in this field for many years. Get 10%* discount this week only.